Ottendorfer Library, 135 Second Avenue at 9th Street, New York, NY 10003. (212) 674-0947. Saturdays at 10 a.m.
Mulberry Library, 10 Jersey Street, between Lafayette and Mulberry Streets, New York, NY 10012. (212) 966-3424. Fridays at 10:30 a.m. When I arrived at the Bilingual Birdies Speakin' Spanish class at the Mulberry Library on Jersey Street in Soho, I was blocked by a library employee. He pointed to a sign on the door which declared, "Filled to capacity," a weekly occurrence. I explained I was there to write about the program and observe the Friday 10:30 a.m. class. I entered the packed room of 40—parents, grandparents or nannies with varying numbers of kids in their care—and navigated my way through a tangled cacophony of keyed up kids, roaming through the space. The younger ones, not yet toddlers or runners, were seated on their caregivers' laps, either on the floor or on chairs. The chaos never completely subsided (think "herding cats," or kids, for that matter). But when the class began, it was controlled chaos, as Hector Ortiz, the unfazed Bilingual Birdies teacher, seamlessly moved from one activity and theme to another throughout the 45 minutes without missing a beat or losing focus. Ortiz exuded energy, self-confidence and resourcefulness, as he switched from guitar, djembe (African drum) and slide whistle, sang, told stories, got down on the floor with the kids for a game of "arriba" and "abajo"—"up and down," talked to them in a combination of English and Spanish, repeating key words and phrases, blew bubbles, waved a blue cloth used like a parachute (a participatory activity) and was thoroughly entertaining. The kids, from six months to almost five years, a common age range at the libraries, and of many ethnic groups, were in various states of engagement and attention spans. One of the liveliest youngsters was three-and-a-half-year-old Dakori, there with her nanny Annie and sister Deina, one and a half. "The little one interacts more since we have been coming," Annie noted, "and the big one has picked up words and is more into dancing and singing." Ortiz, a talented musician, who hails from Bayamón, Puerto Rico, has observed similar changes in his charges. "When I first came here in 2013, the group was smaller and the kids were shyer. Now they interact more. When I get here, they say 'Buenos días.' When I leave, they say, 'Adiós' and give me a hug." He added, "Some of the parents and nannies say they are speaking Spanish at home, saying words from class. It's not just fun but also getting something valuable out of the program." Sarah Farzam, who founded Bilingual Birdies in 2007, acknowledged that they will certainly learn 10-15 new words in the foreign language in each class, but she has a more global purpose in mind. "Our bigger mission is to guide children to embrace diversity, celebrate culture and cultivate an open-mindedness for 'the other,'" she wrote in a comprehensive email from Mexico City in response to my questions. Farzam herself is an amalgam of cultural diversity—half Iranian Jewish and half Mexican—and speaks four languages (English, Farsi, Spanish and Hebrew). She continued, "It's about getting kids to make friends with different people and respect those differences so they can grow up to be more respectful global citizens. As you will experience in a Bilingual Birdies class or Culture Academy training session, we do this through loads of imaginative play, awesome music and super fun movement activities." Bilingual Birdies has grown to over 2,000 participants, which encompasses 97 libraries ("on a rolling basis") in the five boroughs and private and public schools. The languages currently in use are Mandarin Chinese, Spanish and French, with Hebrew at the Riverdale Library in the Bronx when they ask for it. "We provide them with all of the lesson plans, classroom materials and online portals with audio files and videos on how to teach an exemplary class," Farzam explained. "We also provide parent materials like our original music CDs and vocabulary sheets." In the winter, she launched the program in San Francisco, and so far, they have 150 kids there. "Growing, growing!" she exclaimed. However, it is not enough to be proficient in a foreign language, play a musical instrument and like kids to be accepted into the Culture Academy. "We ask for an audition video, requiring them to do certain things that we do in class, and if they pass, they are invited to a three-part interview where we ask them things like, 'What is the most important thing your parents ever taught you?'" she explained. "There are a lot of people out there who can get up in front of kids and just fake it. We're actually trying to change kids' lives here, and very, very few people are true educators who can genuinely connect with children and be their authentic selves while applying our curriculum to truly embrace language and culture in the classroom." The program attracts people of all ethnicities, not just those who have a connection to the target language. One of the more intriguing participants was a two-and-a-half-year-old Chinese boy who was with his grandmother. Neither spoke much English, but they clearly were enjoying the class. Through various ways of framing questions, the grandmother finally understood, "Why are you here?" She responded, laughing, "Spanish is good. Very happy. Music is very good." Lucy, who is from England, brings her son Julian, 15 months, because she said it's good for his development. Her husband is Cuban, so they want Julian to be bilingual. "It's a fantastic program," she said. "It's entertaining and engaging and great for young kids to have that stimulus, especially with the music." Both classes were similar in content and structure—and bag of Bilingual Birdies tricks of the trade. One of the staples is Myla, a yellow plush puppet, which looks like Big Bird's love child. "The kids love her," said Farzam. "The puppetry portion of the class serves to connect with kids on a social-emotional level. If you noticed, each time she came out she expressed some issue she was dealing with—tired, hungry, shy, cold, scared, etc. Each week it's a different thing she's up against, and she teaches kids the vocabulary associated with that through some movement activity. Our goal is to show kids that Myla is up against things that they are as well, but she's able to communicate nicely and resolve her issues with the help of the class in a fun musical and movement-based way." At first, they wrote songs and classes about things like animals, counting and body parts "because that's what they are already learning in their lives in their native language," explained Farzam. "But then I realized kids have tons of questions and are inherently curious, and it's just up to us to bring that out of them. So now the concepts have evolved into things like pedestrian safety, transportation, manners, emotions, healthy eating and how to make friends." Farzam strongly believes in giving back to the community, so she has instituted an ESL program for immigrant families in Bushwick, Brooklyn, for which the teachers volunteer, using the Bilingual Birdies methods. Also, Culture Academy is now available to schools to implement their own Bilingual Birdies program. "It is for sure the most fun training their teachers will ever take," said Farzam. On May 15, Bilingual Birdies is offering a special workshop in New York City called Global Passport, which is an excerpt of their larger training. It is a two-hour professional development on how to embrace diversity in the classroom by using music and movement and is designed for early childhood educators who are non-musicians. There are streaming options available for those outside of the city, said Farzam. Barragán and Ortiz are among the dozen or so teachers happily employed by Bilingual Birdies. Said Ortiz, "I feel proud I can be part of this. I hope I can keep doing it for a long, long time." Annie the nanny hopes so, too. "We love the program," she said. 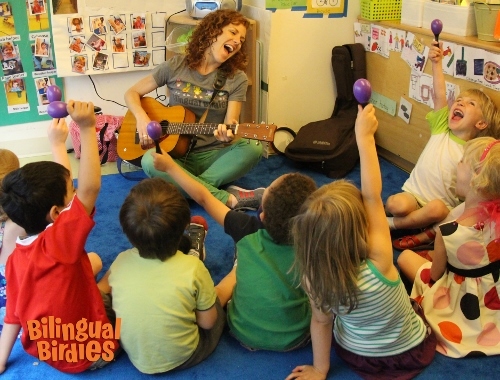 Bilingual Birdies Spanish class with Solange Prat in a Brooklyn preschool. Kids learn through live music and dance.